Century Fuel Products Tri Fuel Generator Conversions. Here is the generator with the air cleaner removed, ready for the new gas valve to be installed. 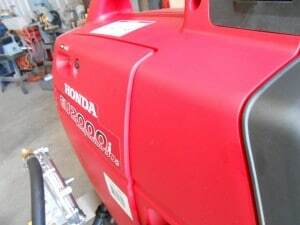 The other day I converted a Honda Eu2000 into a tri fuel generator. Now this is the second time, I have converted one and I am no mechanic, if I can do it anyone can. Now a tri fuel generator runs on gasoline, propane and natural gas. Natural gas may be available for a period of time after electricity fails. Propane stores indefinitely and gasoline may be available at times. With the ability to run on all three fuels you have a better chance of finding fuel in an emergency. 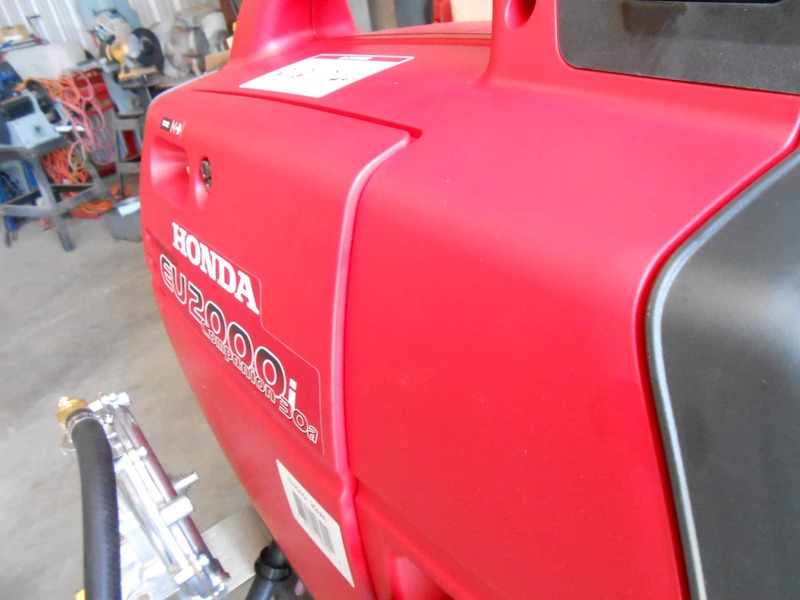 The Honda Eu2000i tri-fuel kit that I installed came from Century Fuel Products . This company manufactures a wide range of adapters that sell from $199 and up. 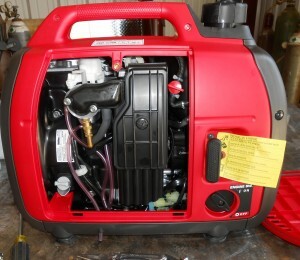 Most generators can be converted for the minimum price and there is free shipping on most orders. 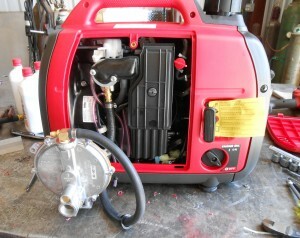 Here is the generator with the new fuel valve installed. It is to the right of the air cleaner. There are two main types of conversion units currently on the market that I am aware off. The one requires you to change your carburetor. The one manufactured by Century Fuel Products is an adapter that uses your current carburetor. 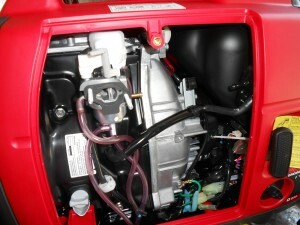 An adapter will mix the Propane or Natural Gas into the air stream before the gasoline carburetor. The adapter was surprisingly easy to install. The hardest part was installing a shut off valve on the fuel line. They provided the extra fuel line hose needed to install the valve and it is good quality. You have to work a bit to get it onto the fittings. The rest was a piece of cake. As you can see the cover does not fit completely flat after the conversion. I really liked the way in which the regulator was attached. It was mounted on a metal bracket that attaches to the feet on the bottom of the generator. Some other brands attach theirs to the plastic body, which I am afraid might weaken over time. 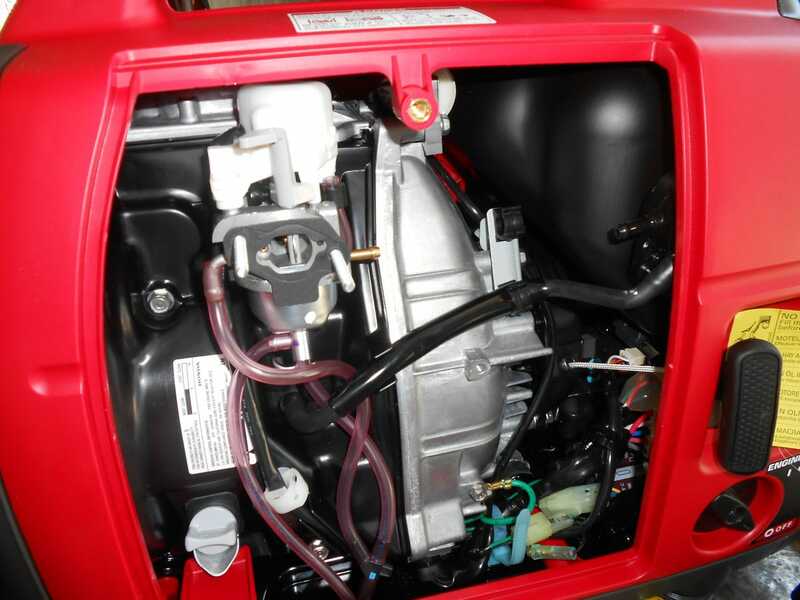 Once the unit was installed we connected a propane tank to the tri fuel generator, primed the unit with the button on the back of the regulator and it started on the second pull. At first, it ran a bit rough, but then we found out that there are two adjustments on the regulator. One adjusts sensitivity and the other adjusts the needle valve. While the instructions were excellent on the whole, they did fail to mention the two adjustments on the regulator. It took a single phone call to the manufacturer to find out about them. They stated that in the future they will redo their instructions to include this information. If I have any criticism, it would be that the cover does not fit quite flush with the body after you install the adapter. But I can live with this. Based on my experience I can recommend Century Fuel Products. Personally, I will run my tri fuel generator on propane or natural gas as much as possible. You do not get gummy residue in the carburetor and it eliminates the worry about the carburetor being clogged up from old fuel. Converting a Coleman Stove to Use 5 Gallon Tanks of Propane. What Type of Diesel Fuels Can You Run in Your Diesel Engines? This entry was posted in equipment, fuels and tagged Tri Fuel Generator. Bookmark the permalink. 7 Responses to Century Fuel Products Tri Fuel Generator Conversions. Nice write up – good info. Like you, I also grabbed up a Honda 2000 tri-fuel generator – I use it (so far) exclusively with propane. I agree with everything you say here, especially the part about not gumming up the carb. Unlike you, I bought from a place (in Maine, I think?, 3-4 years ago) that offered the conversion on their new units, as I didn’t feel confident enough in my handyman skills. 1 note to add, propane & nat-gas are less energy-dense than gasoline – usually rated at ~90%. This means that our generators are really more like ‘1800W-max’ gen-sets when running propane & nat-gas. I’d advise that people looking into this carefully consider their energy needs/demands – you may find that you’ll need a larger gen-set (e.g., 3000W) if you need >1500W of power & plan to run propane often. I have two Honda EU2000’s with the tri-fuel conversion. The first one I bought already converted from Central Maine Diesel , runs like a Singer sewing machine on gas or propane! The second one I bought new and used the conversion kit from Century Fuel Products. The unit runs fine on gasoline, but propane is a different story. 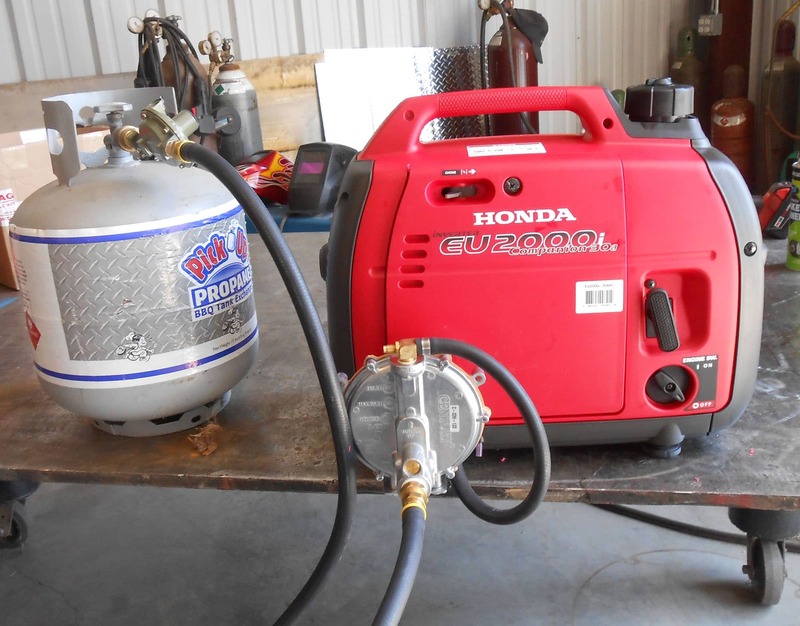 The two fuels (liquid/vapor) have different requirements and burn characteristics that should fit in the envelope of the carburetor and propane systems of the generator (they do on my first unit). The second unit just will not run smoothly or carry a load on propane? The #2 Honda acts like an ignition problem ( misses,backfires,cuts out,etc)? Went thru all the checks (plug,Propane,Electrical system), and all I could find was an exciter coil over the specs (Honda specs.. 0.2-0.3 Ohms) my reading was 0.78 Ohms. Very little info on the Web talking about others with this type of problem?? Thank you. Extremely helpful. This is the only publication about this product. All search results are for the purchase only including their website. I Emailed them for literature, no response. Saludos y buena estrategía para evitar consumo y contaminación, tengo un generador HONDA EU2000, y quisiera pasarlo a butano, dónde podría conseguir el convertidor y si podrían poner un esquema para poderlo montar, sin más agradecido atte, desde las Islas Canarias.